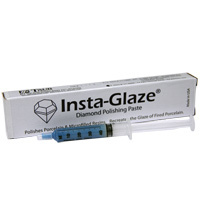 Insta-Glaze is a simple technique using a diamond paste-felt wheel polishing system to achieve the highest polish to porcelain and composite resins. By re-creating the glaze of fired porcelain chairside or benchside with our system, it eliminates additional re-firing which could result in coarse vitrification, porcelain discoloration or warpage. The 3 micron diamond paste was designed to bridge the gap between the 'finish' from your current polishing wheels, discs or pastes and the ultimate finish that can be attained from the porcelain or composite resin itself. In many cases, its use actually bypasses most of the final polishing procedures after contouring. Adjustments to the porcelain, before or after cementation, no longer pose a problem or compromise to its esthetics. Insta-Glaze re-establishes the glaze in seconds. Insta-Glaze is also economical compared to the other 'less expensive' pastes. It uses less material to achieve a higher polish and doesn't splatter or run during polishing. Using Insta-Glaze on micro-fill resins will create a high polish in seconds. This polish is obtained with minimal effort, surface reduction or generated heat, using a felt, Robinson wheel or prophy cup. The Insta-Glaze HYB, 0.5 microns, was specially developed to create an extremely high polish to hard-to-polish hybrid resins. We also carry a 0.2 micron HYB polish for systems such as Art- Glass&reg; and BelleGlass&reg; and the new nano-filled resins. * For contouring or adjusting, our soft, flexible Porceflex (gray) wheels, eliminates the use of a diamond or other abrasive wheels, while leaving a smooth semi-gloss surface. The Porceflex wheels do not generate heat, micro-fractures or patient discomfort like the harder wheels or diamonds do. See our Porceflex page for more information. Click Here. - First and best on the market. 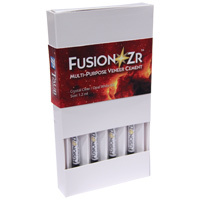 - Use for all Porcelain restorations where silanation is indicated. 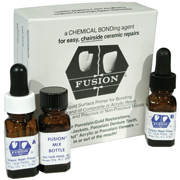 - Repair chipped and broken restorations.